When I first set out on my birth family search in 2012, I could never have imagined the chain of events that I was soon to experience. What started as a simple one-line note to the ‘Post Adoption’ email address at Eastern Social Welfare Society (ESWS) slowly blossomed into an unforgettable journey of self-discovery, fulfillment and happiness. Going into my search, I had very few expectations; I was fully prepared to never find any information, much less find my birth family or ever be put in touch with them. So when I initially reached out to ESWS, it was simply a request for basic information about my adoption, and I never really expected to hear anything back. When I didn’t hear from ESWS for several months, I was neither surprised nor discouraged, and after a while forgot that I had reached out at all. Several months after my initial email, I received a phone call from Pauline at New Beginnings in Long Island, New York, an adoption agency that works closely with ESWS. To my surprise, Pauline told me that she had received information from ESWS about my birth family — from this point on my life would be changed forever. I was born on December 10, 1983 in a clinic in Daegu, South Korea to a young, single mother. Four months later I was adopted by American parents living in Webster, New York, a suburban town outside the city of Rochester. In my adopted family I am the youngest of five children. My parents already had two biological sons when they decided to adopt me. Soon after I arrived, my parents decided to adopt two more little girls, this time two sisters aged seven and four, also from Korea. I had a wonderful and happy childhood, surrounded by loving friends and family. My parents understood how precious and fortunate we all were as a family, and instilled in us children an honest set of values: responsibility, the value of hard work and the importance of a good attitude. Growing up, when I reflected upon the many privileges and blessings that life has brought me (my family, the friends I have made, and all the things I have accomplished thus far), I could not help but think about my birth parents. For as long as I could remember I had always hoped to find a way to connect with them. I always wondered how I came into this world. I was curious about my heritage, my family roots, and quite simply, why I look the way I look. I had the urge to let my birthmother know what I had become — that because of her sacrifice I have been able to live a wonderful life. I felt that she had the right to know who I was, and that if she knew about me it would bring a sense of peace in my own life. With the generous help of New Beginnings and ESWS, I have corresponded with my birth mother and birth father for the past two years through letters. These letters have had a profound effect upon me and have played an enormous role in my ongoing process of self-discovery. Being in contact with my birth parents has helped to complete a missing part of my very identity that I have always longed for. Most importantly, it gave me the chance to tell them that I am alive and so grateful for the life they gave me. I have learned so much about my family history, about how my parents met and their present lives. I even discovered that I have a younger half brother! This past September, along with five other adoptees from the United States and Australia, I had the unique opportunity of being accepted into the Home to Home Program hosted by ESWS. In early November, I traveled to Korea with my husband to participate in the program and meet my birth families. I spent the most unforgettable week of my life in Korea reuniting with my birth families and meeting five other amazing adoptees. 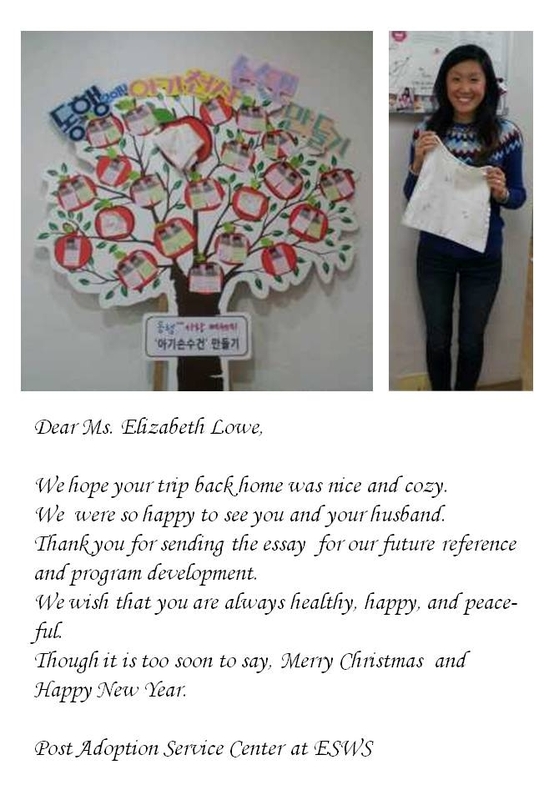 Not only did we all get to travel to our hometowns and spend a lot of one-on-one time with our birth families, we were also able to spend time at ESWS at the Babies home and got to travel to Pyeongtaek Welfare Town. Here, we learned about the wonderful work ESWS is doing to support special needs and disabled children as well as unwed mothers. During our short stay, we even met adopting parents from the U.S. who were in the process of adopting their own child from Korea. The feelings we experienced in witnessing this full circle, and getting the unique opportunity as an adoptee to spend time with orphaned babies and children where we all once stayed, cannot can be described in words. These are moments we will cherish and will never forget for the rest of our lives. One of the most special things about the Home to Home program is getting to meet the other adoptees and having the opportunity to hear their stories. We all bonded quickly and were able to relate so easily to one another. Each and every adoptee has their own unique story; it was amazing to hear their own personal journeys, and how they each arrived in Korea with the same goal of self-discovery. Although each of our lives are so different, we all shared a unique bond and familiarity. I could not have asked for a more perfect group of individuals to share this experience with. I will forever be connected to these people and have hopefully made a new group of lifelong friends — we already have a reunion planned! Although I was in contact with several other adoptees before this trip to help prepare for the program, you can never be fully ready for the emotions and feelings you experience on this journey. Spending time with my birth parents and my extended families has been the most fulfilling experience of my life. It is impossible to put into words how important and comforting it is to simply know where you come from. I never realized how much healing this reunion would bring to everyone involved. I now have a deep personal history that I can continue to learn about and share proudly. Every question I have ever wondered about has been answered and any doubts or questions I ever had about my life were answered for me. My birth families have been very candid with me about my history and welcomed my husband and I with an unimaginable amount of love, compassion and appreciation. I have never felt more proud, connected and whole in my entire life. Until now, I never realized how important it was for me to meet my birth families and for them to see what I have become. I’m so happy that it happened. I cannot even begin to fully convey my gratitude to New Beginnings, the post adoption social workers at ESWS and the volunteer translators of the Home to Home program for all their hard work in organizing the program and reuniting me with my birth family. I am so grateful for all for my friends and families — old and new — who supported me through this process. I am forever thankful.